Private William S. Mezo was one of the new recruits that joined Captain Charles A. Varnum’s B Troop at Pine Ridge on 6 December three weeks prior to the battle at Wounded Knee Creek. 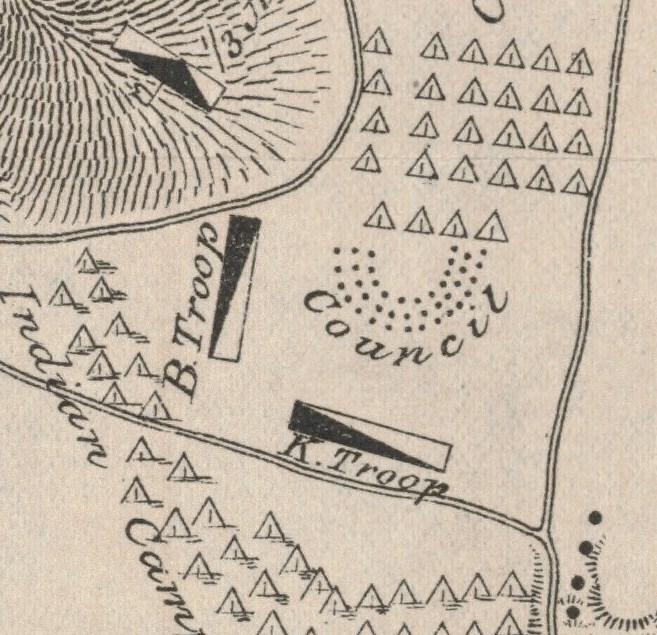 He was twenty-five years of age and had joined the army at Saint Louis just three months earlier. According to one newspaper listing of the casualties at Wounded Knee, Mezo was killed by a gunshot wound to the head, likely suffered during the opening minutes of the initial volley. Born in 1865 in Franklin County, Illinois, William Mezo was the oldest of four children of Cornelius and Malinda (nee Odle) Mezo. Cornelius Mezo, born May 1842 at Hamilton, Illinois, was the son of Constant and Polly Ann (nee Reno) Mezo. He was a farmer and served in the Civil War as a private in Company A, 40th Illinois Infantry and Battery D, Missouri Light Artillery. Cornelius was married three times. He married his first wife, Malinda Odle, on 29 December 1864 in Franklin County. She was born in 1841 in Franklin County, the daughter of Harvey W. and Milley (nee Smith) Odle. Cornelius and Melinda had four children: William, the subject of this post; Millie was born 22 May 1867, married Newton J. Clampet 6 October 1886, and died 8 October 1935; Lucy Catherine was born 27 December 1868 at Jefferson County, Illinois, married first Nehemiah Harland about 1888, married second Peter Rufus Harrison on 21 October 1898, married third Harrisburg Pennsylvania Galloway on 27 March 1920, and died 9 April 1939; and Henry L. was born 7 December 1870 at Jefferson County, married in 1897 Martha Isabella Coffel, and died 15 September 1967 at Warrenton, Missouri. Malinda Odle Mezo died on 8 September 1872. Cornelius next married Mary Jane Hamilton on 17 July 1873 in Jefferson County. Cornelius had five children by his second wife: Constant was born 1877, married Mary E. Skelton, and died 1917; Frank was born 1878, married first Hulda E. Hanna, and married second Ina; Arthur James was born 1881, married first Sarah, married second Ora Johnson, and died 1953; Scott was born 1883, married Maggie, and died 1937; and Maude was born 1885. Cornelius Mezo’s third wife was Nancy W. Short whom he married in 1889. With her he had two more children: Elza was born 1889, married Bertha Fred in 1910, and died 1959; and Myrtle was born 1893, married Thomas N. Hall and died 1973. Cornelius Mezo died at the age of seventy-eight in 1920 at Bald Hill, Illinois. Captain Varnum completed an inventory of Private William S. Mezo’s personal effects at the end of January 1891 and forwarded them to Mezo’s father at Fitzgerald, Illinois. William Mezo made his way to Saint Louis, Missouri, a year after his father married his third wife, and enlisted in the Army for five years in September 1890. He was recorded as being a twenty-five-year-old farmer standing just under five feet seven inches, with dark brown eyes, brown hair and a fair complexion. Three months later Mezo along with other recruits from Jefferson Barracks were sent to the Pine Ridge Agency, South Dakota, to bring the under-strength cavalry units closer to their authorized level of personnel. Private Mezo was buried along with thirty of this fellow cavalrymen on New Years Eve, 1890 at the Episcopal Cemetery at the Pine Ridge Agency. As with the majority of those soldiers, Mezo’s remains were disinterred in October 1906 and reburied in the Fort Riley Post Cemetery. William Mezo was survived by his father, Cornelius Mezo, six brothers, three sisters, and three nieces. 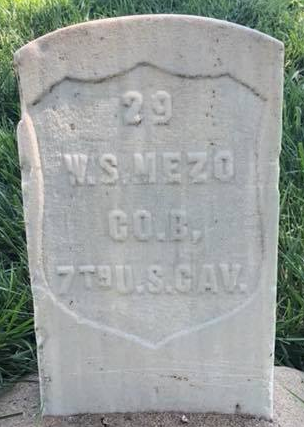 Private William S. Mezo is buried at the Fort Riley Post Cemetery in Kansas. Ancestry.com, U.S. Army, Register of Enlistments, 1798-1914 [database on-line], Provo, UT, USA, Ancestry.com Operations Inc, 2007, Original data: Register of Enlistments in the U.S. Army, 1798-1914, (National Archives Microfilm Publication M233, 81 rolls), Records of the Adjutant General’s Office, 1780’s-1917, Record Group 94, National Archives, Washington, D.C.; Omaha daily bee., January 01, 1891, Part One, Image 1,http://chroniclingamerica.loc.gov/lccn/sn99021999/1891-01-01/ed-1/seq-1/ accessed 4 Nov 2013. 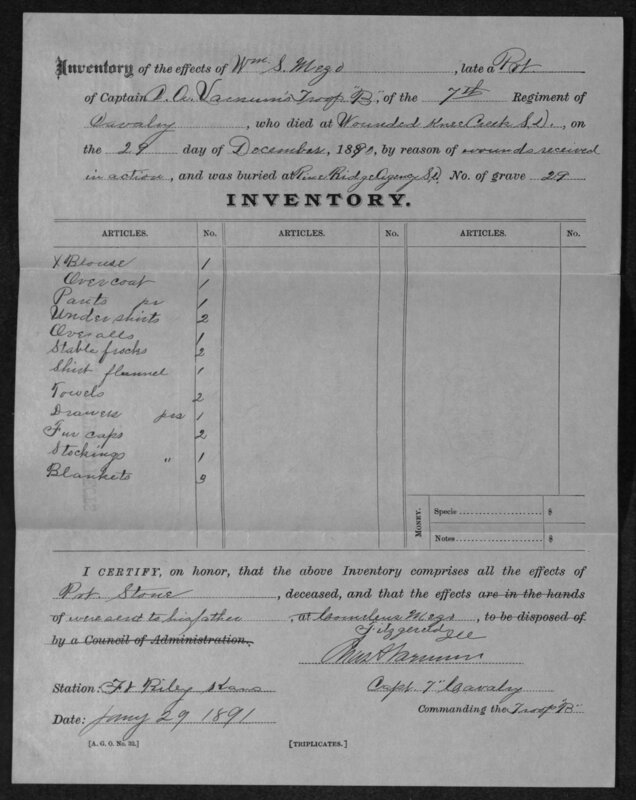 Ancestry.com, United States Federal Census [database on-line], Provo, UT, USA: Ancestry.com Operations, Inc., 2009; Year: 1850, Census Place: District 10, Hamilton, Illinois, Roll: M432_108, Page: 211B, Image: 429; Year: 1850, Census Place: Franklin, Illinois, Roll: M432_106, Page: 17B, Image: 235; Year: 1860, Census Place: Township 6 Range 5 E, Hamilton, Illinois, Roll: M653_183, Page: 36, Image: 36, Family History Library Film: 803183; Year: 1870, Census Place: Township 4 Range 1, Jefferson, Illinois, Roll: M593_233, Page: 430B, Image: 78, Family History Library Film: 54573; National Park Service, U.S. Civil War Soldiers, 1861-1865 [database on-line], Provo, UT, USA: Ancestry.com Operations Inc, 2007; Historical Data Systems, comp., U.S., Civil War Soldier Records and Profiles, 1861-1865 [database on-line], Provo, UT, USA: Ancestry.com Operations Inc, 2009. Ancestry.com and The Church of Jesus Christ of Latter-day Saints, United States Federal Census [database on-line], Provo, UT, USA: Ancestry.com Operations Inc, 2010; Year: 1880, Census Place: Bald Hill, Jefferson, Illinois, Roll: 215, Family History Film: 1254215, Page: 418D, Enumeration District: 045, Image: 0600; Year: 1900, Census Place: Bald Hill, Jefferson, Illinois, Roll: 308, Page: 9B, Enumeration District: 0065, FHL microfilm: 1240308; Year: 1910, Census Place: Ball Hill, Jefferson, Illinois, Roll: T624_294, Page: 1A, Enumeration District: 0092, FHL microfilm: 1374307; Year: 1920, Census Place: Bald Hill, Jefferson, Illinois, Roll: T625_376, Page: 4A, Enumeration District: 115, Image: 259; National Archives and Records Administration, U.S., Civil War Pension Index: General Index to Pension Files, 1861-1934 [database on-line], Provo, UT, USA: Ancestry.com Operations Inc, 2000. Ancestry.com, U.S. Army, Register of Enlistments, 1798-1914 [database on-line], Provo, UT, USA. 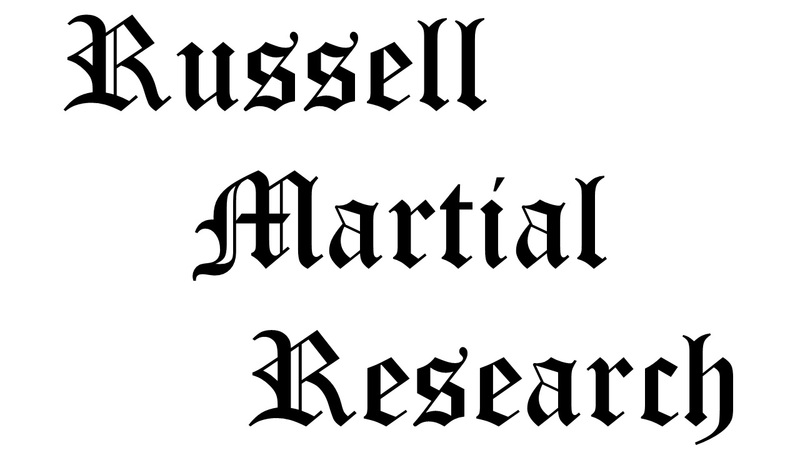 Ancestry.com, U.S. Military Burial Registers, 1768-1921 [database on-line], Provo, UT, USA: Ancestry.com Operations Inc, 2007, Original data: Burial Registers for Military Posts, Camps, and Stations, 1768-1921, Microfilm Publication M2014, 1 roll, ARC ID: 4478153, Records of the Office of the Quartermaster General, Record Group 92, National Archives in Washington, D.C.
 Adjutant General’s Office, Final Statements, 1862-1899, “Haselwood, Alvin H.,” at Fold3, http://www.fold3.com/image/271303501/ accessed 5 Nov 2013. This entry was posted in Casualties, Enlisted and tagged 1890, 7th Cavalry, 7th Cavalry Regiment (United States), Big Foot, Cavalry, Fort Riley, Killed in Action, Lakota, Mezo, Miniconjou, Oglala Lakota, Sioux, Wounded Knee, Wounded Knee Creek, Wounded Knee Massacre. Bookmark the permalink.